These days it’s easy to watch modern race cars and underestimate the enormous effort and skill that’s required to keep the things on the track. Laden with aero, cars can look so stable and unerring in directional change that the velocities they’re racing at appear deceptively slower than they actually are. Unfortunately it often takes a huge accident to remind us of the fine line between grip and disaster. 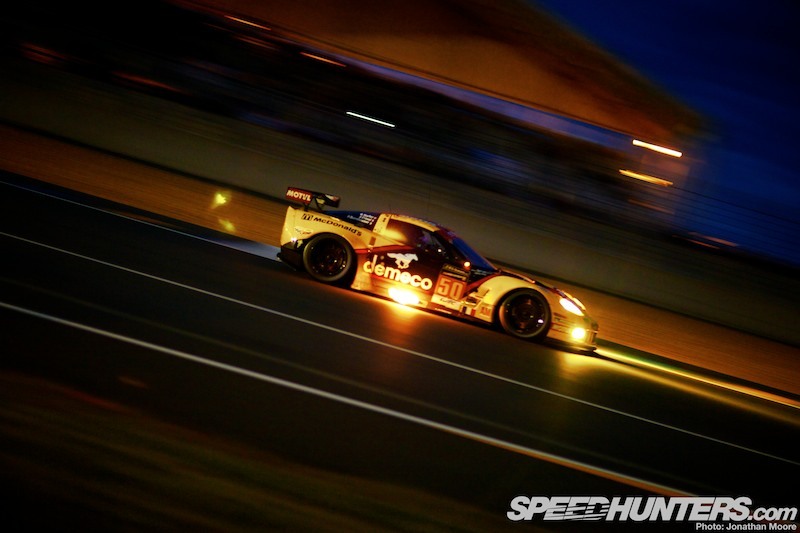 At this year’s Le Mans 24 Hours, several cars were severely damaged during practice and qualifying, slamming into barriers as that line was crossed with dramatic results. As we know, this pattern culminated with the tragic death of Allan Simonsen in the #95 Aston Martin Vantage early in the race itself. 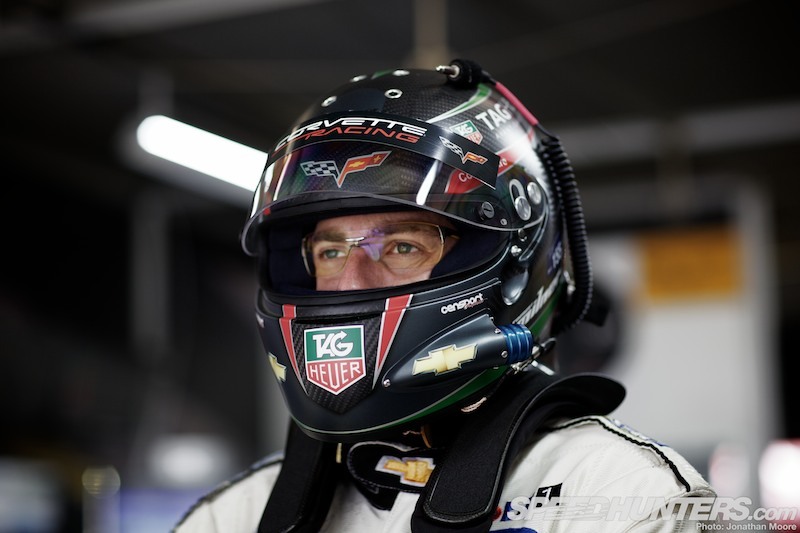 The whole event was rocked by the loss of this popular driver, and it highlighted the risks that racing drivers take every time they venture out on track, even in these safety-conscious times. The inherent danger of motorsport hasn’t gone away, and never will. 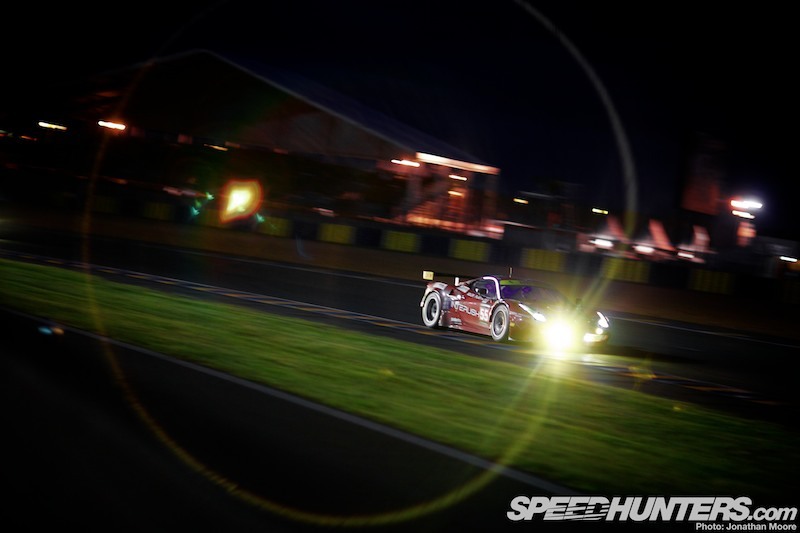 Putting that sad event to one side, in this story I wanted to investigate what it’s like to be inside a cockpit at Le Mans: what aids drivers have to help them, how they cope with the changing track conditions around the long lap and the constant traffic – especially when night descends. 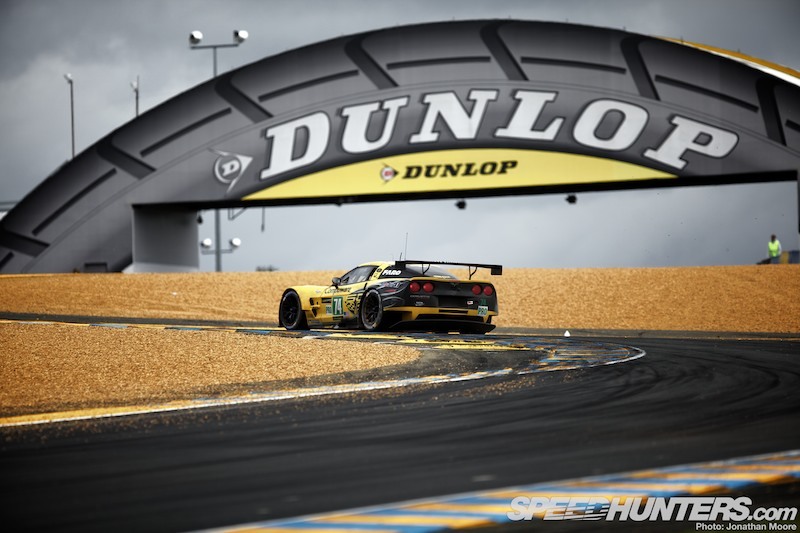 In the run up to the event, I talked to factory Corvette GTE-Pro driver Tommy Milner to get the driver’s perspective on what it’s like to be behind the wheel around the Circuit de la Sarthe. 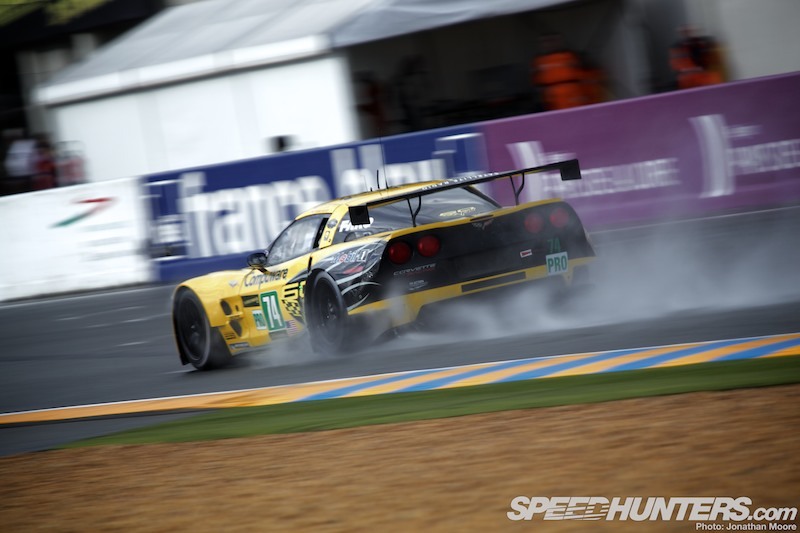 He was part of the crew for the #74 C6-ZR1, driving alongside Oliver Gavin and Richard Westbrook. 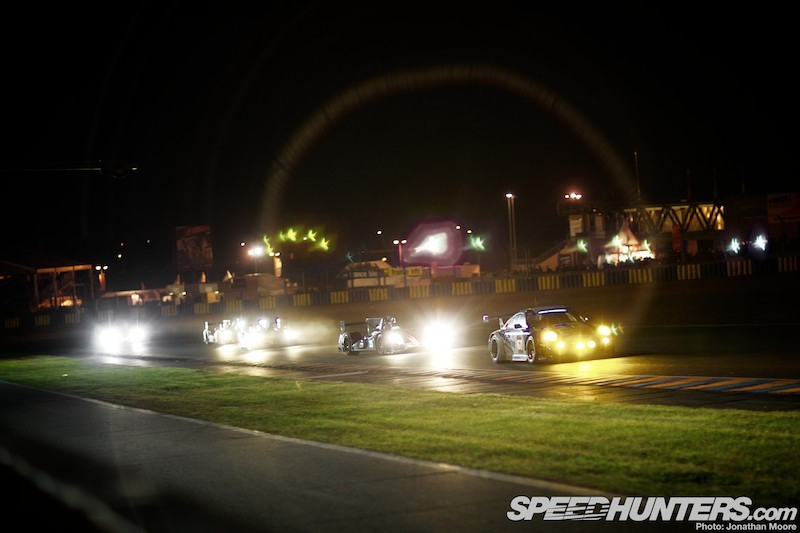 Tough doesn’t begin to sum up the conditions at Le Mans, particularly when you have weather changing all the time and eight hours of pitch black driving in the mix. Gone are the days when you drove a car purely by the seat of your pants: just you and an oily mechanical warhorse beneath you. Modern GTs and prototypes are hives of technology, controlled by computers and powered by electronics, backed up by a team of personnel back in the garage. Tyres, brakes, engine, temperatures, shift lights, apexes, track-outs, mirrors, radar, straining eyes, radio, night vision glasses, aching arms, position, opposition, traffic, pit-stop, gravel, dirt, rubber, rain, sun, cloud, darkness, oil, damage… These are just some of the myriad things a driver has to think about, all whilst travelling at over 180mph. 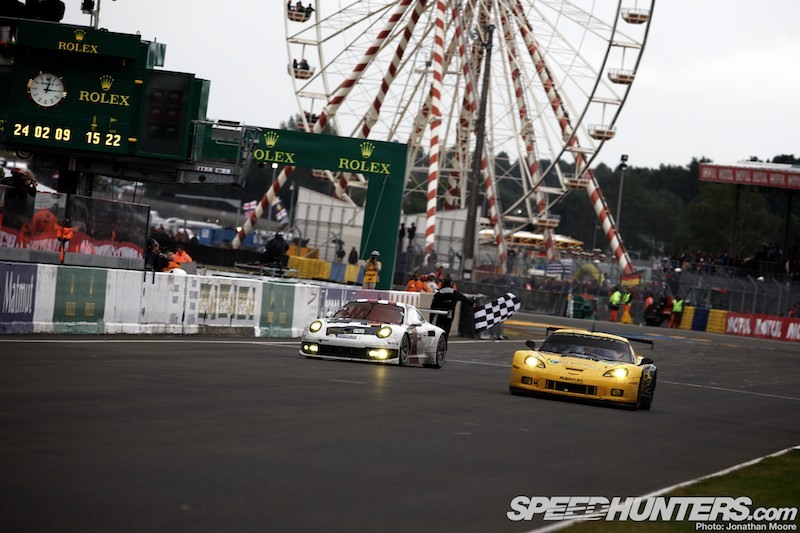 Le Mans takes the normal challenge of a race and magnifies it. Multiple classes. Phenomenally fast straights. Long periods of full throttle. Constant traffic. A day-long race. 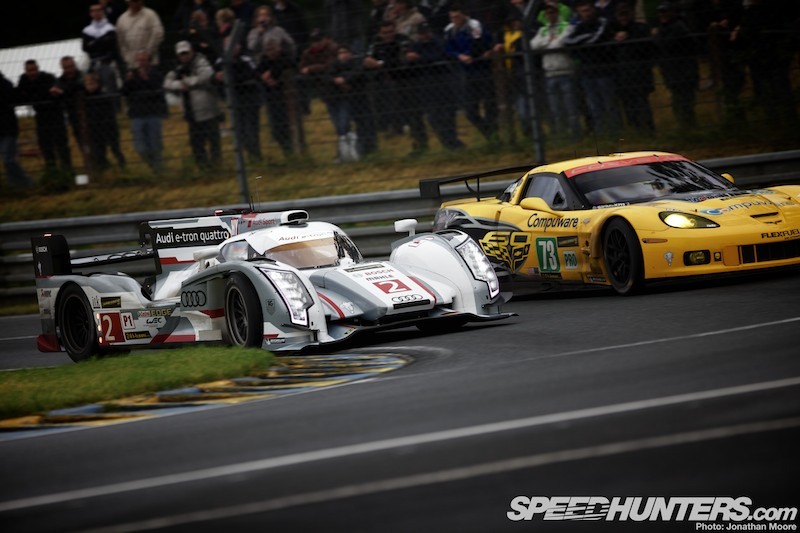 The Nürburgring seems dangerous enough, but Le Mans is a high-speed pressure cooker. 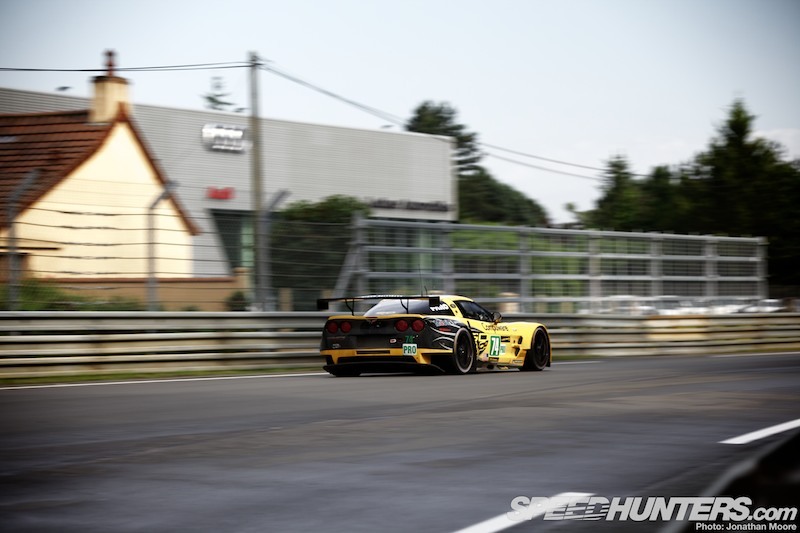 There may have been four groups of cars (two prototype and two GT classes), but they could then be split down into further sub categories (factory versus privateer, differing quality driver line-ups and so on) – though none of that really mattered. There were 56 cars, so there were 56 classes. 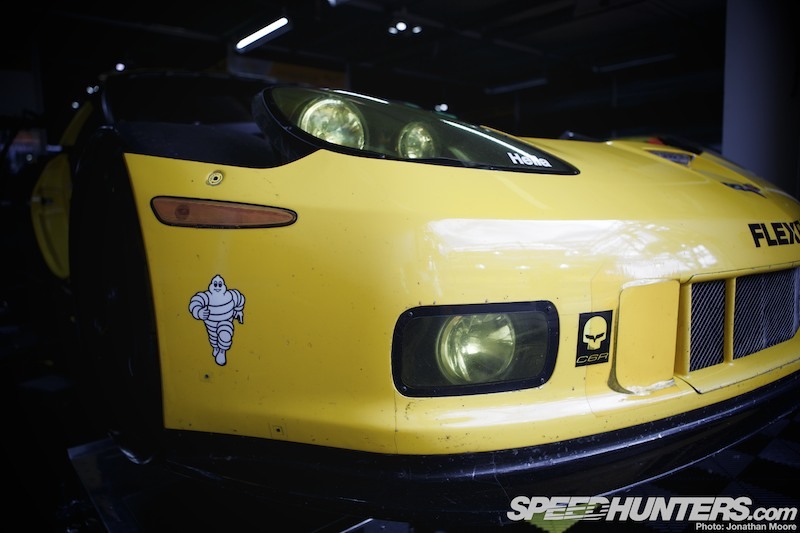 Each car was in its own race, its own battle to win. To get through the 24 hours. To make it through. 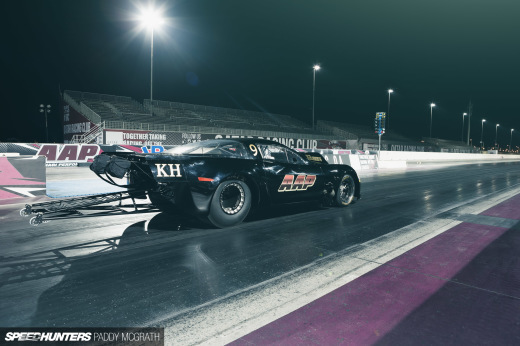 It looked hard enough to watch from the side of the track, safely tucked behind a lens. 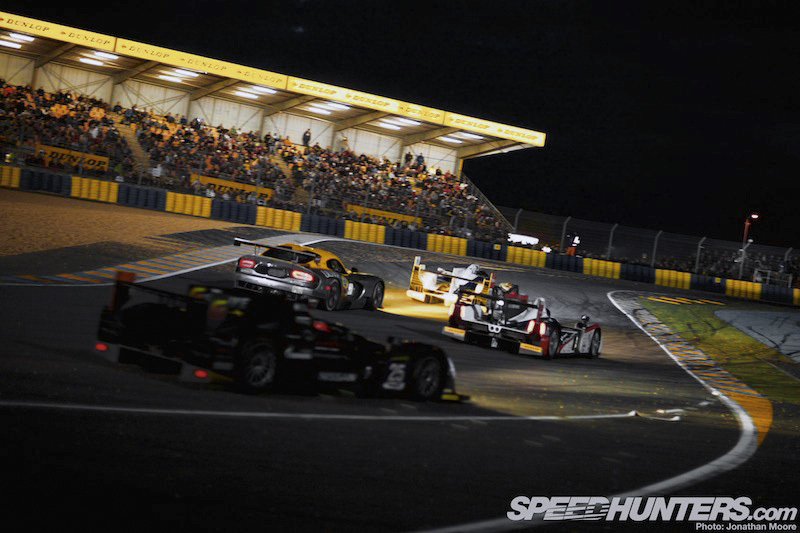 There was never time to look away – cars passed by in a constant stream, drivers sending in passes this way and that, opponents locking up or skating wide in avoidance as everyone tries to lose minimum time whilst maintaining maximum forward momentum. 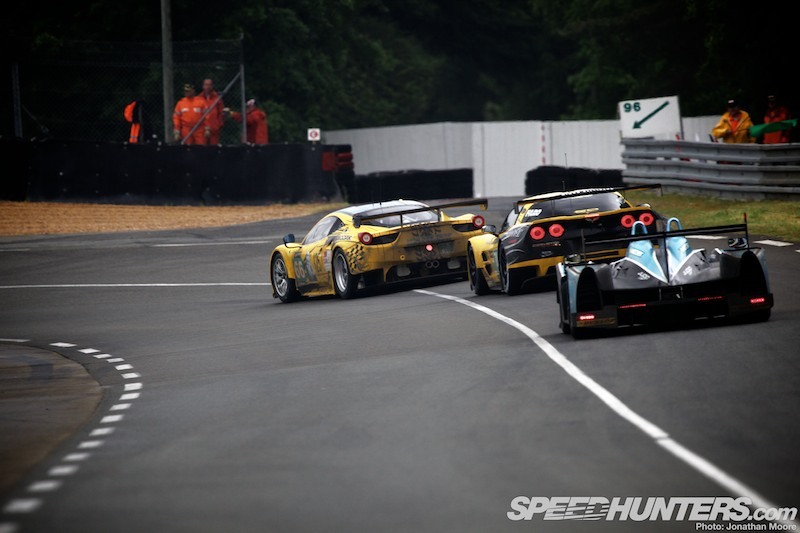 How about coming over the blind brow at Dunlop to find an LMP2 facing the wrong way? Tommy: “We get help from the on-board systems and crew to keep informed about cars coming up behind, but passing and trying to get through traffic is completely up to the driver. 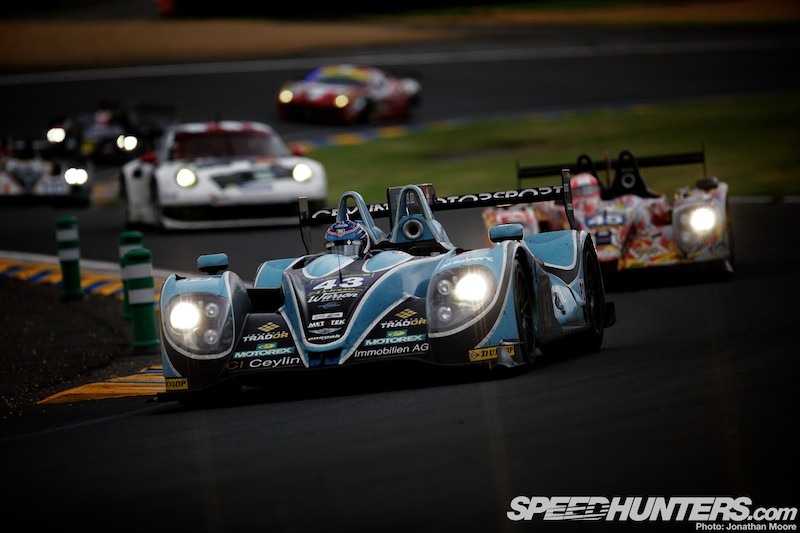 A lot of drivers want to defend their position, even if it’s against an LMP. You can spend a couple of corners fighting with someone and lose a lot of time. There are many cases where it’s better to let someone by and just carry on. 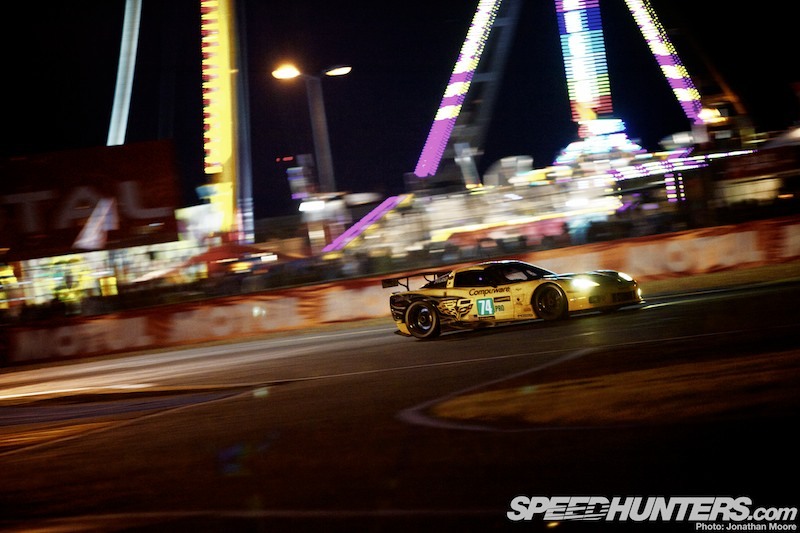 The crazy thing is that for at least the first half of the race – a cool 12 hours, remember – Tommy and the rest of the dozen or so fastest GTs would be battling around 20th position at best. 20th. Not first, or fifth. Or even 10th. 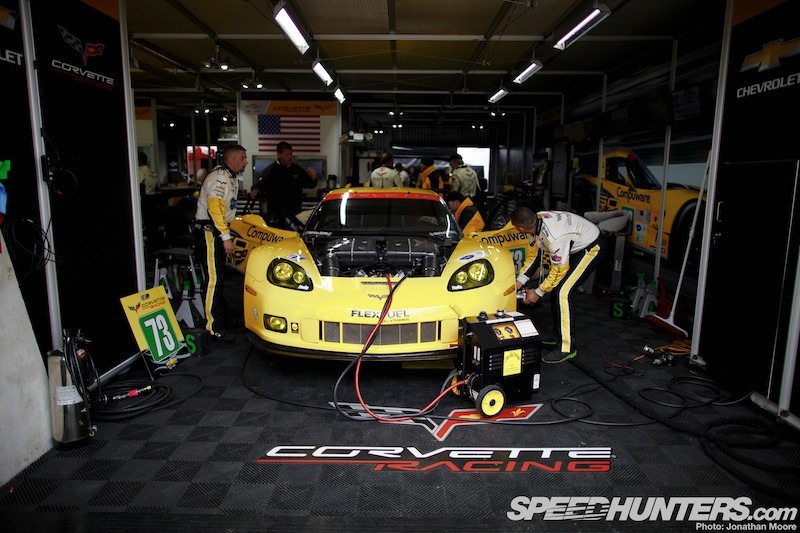 With modern reliability, barring melt-down the GTE leaders were only ever going to be into the teens come the end of the race. 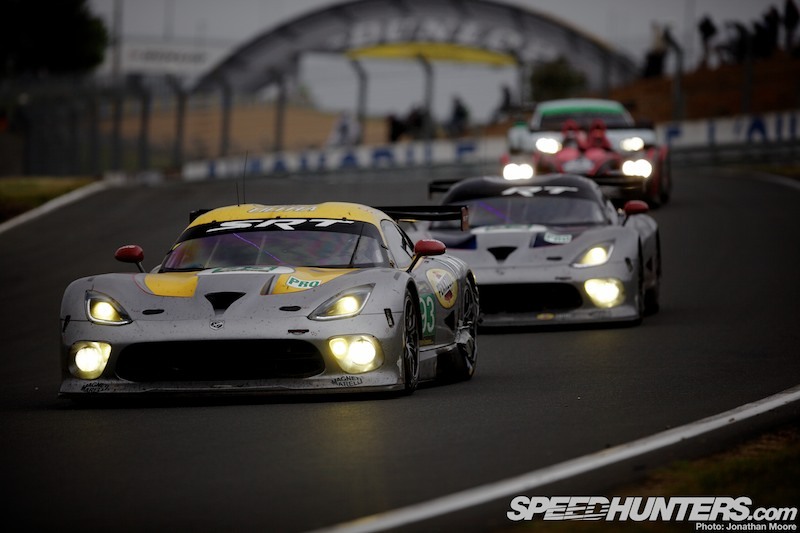 Yet these were the fastest GT racing cars on the planet. 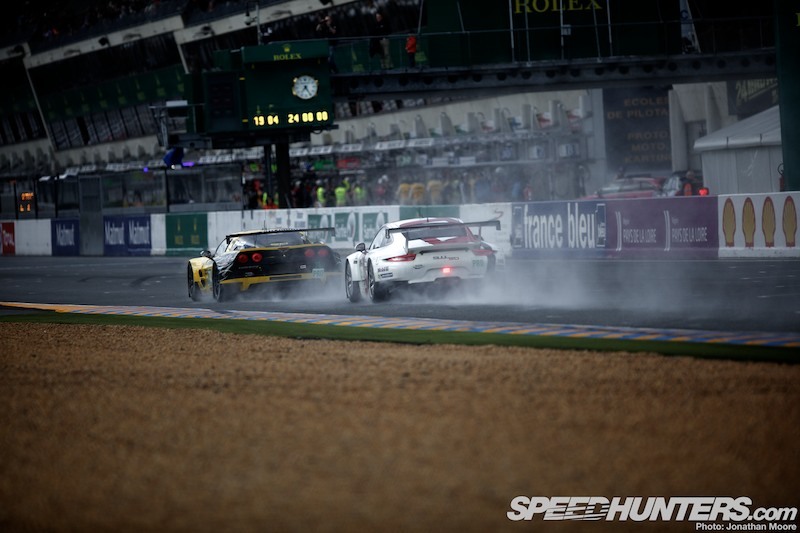 The GTE cars have already got down to the kind of times being set by the old fire-breathing GT1 cars around Le Mans, down into the low 3m50s. 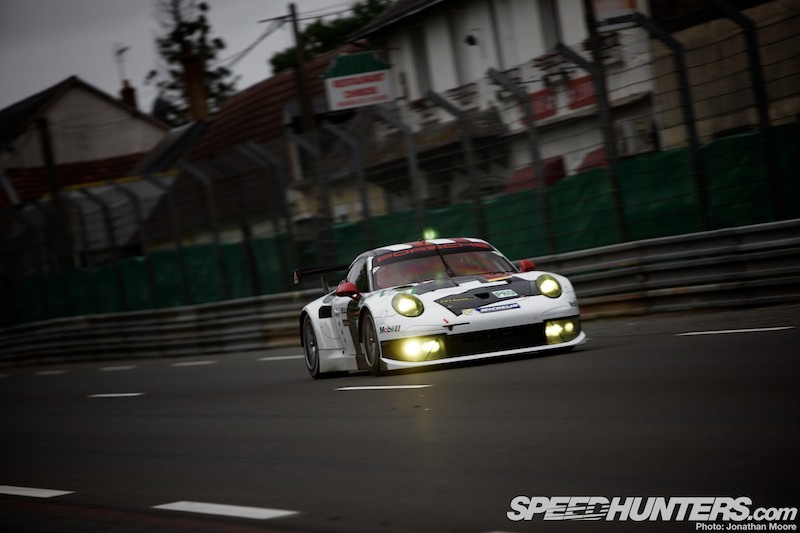 The pros treat the Le Mans 24 Hours with maximum respect. It’s about that speed. 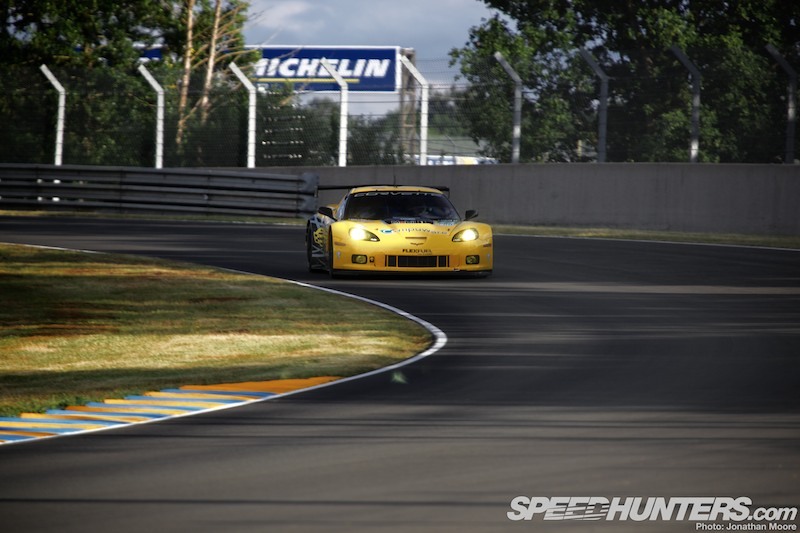 There is no other race track where the cars reach maximum velocity so often or maintain it for so long. That’s quite some use of the term ‘easy’! Next you have the public roads section: lined with Armco, a narrow aperture to aim the car down, interrupted by the two chicanes. 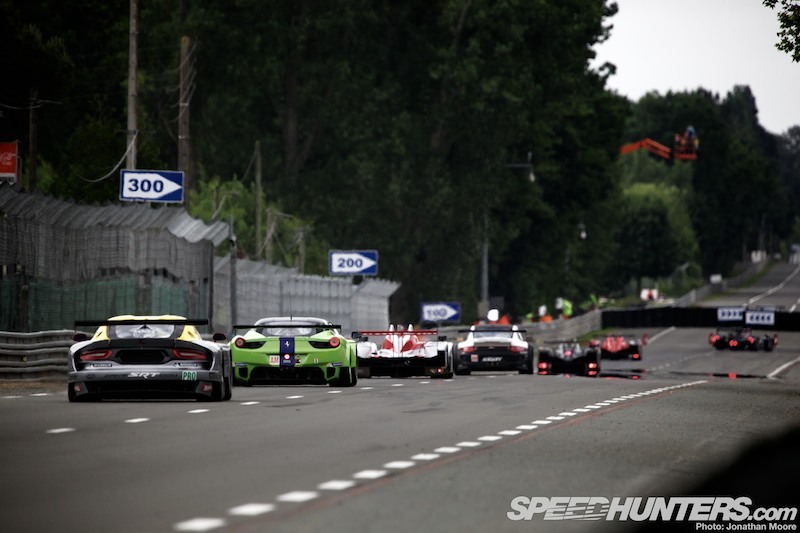 It’s here that you get the reinforcement of just how fast cars go on the Hunaudières straight, where the cars hit maximum velocity within seconds, maintaining it right down to the chicane braking zones. As the cars zipped past in high-speed slipstreaming battles, I became a bit punch drunk from the doppler effect of the engines bouncing off the trees and buildings. 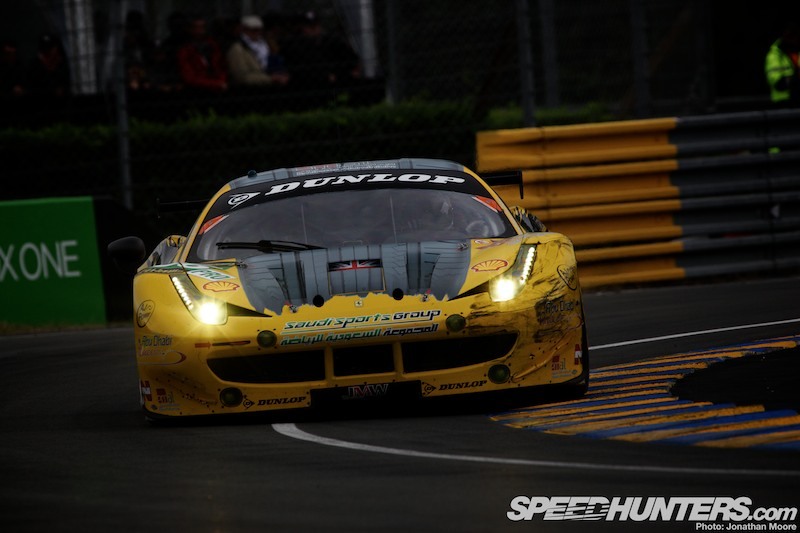 The Ferrari 458 in particular had a rasping high note that doubled back across the track as it passed. Tommy: “That section feels incredibly fast. It’s broken up by some very difficult big braking zones at the chicanes and at Mulsanne, which are easy to underestimate. “What’s difficult about them is that we’re braking super, super late. That’s one thing that makes it so tough now: if you look back at older cars with their longer braking distances you had time to make a move and be a bit more creative on the brakes. Whereas we’re so late on the brakes, going way past the 200-metre marker for both chicanes; the time we’re on the brakes is very short. 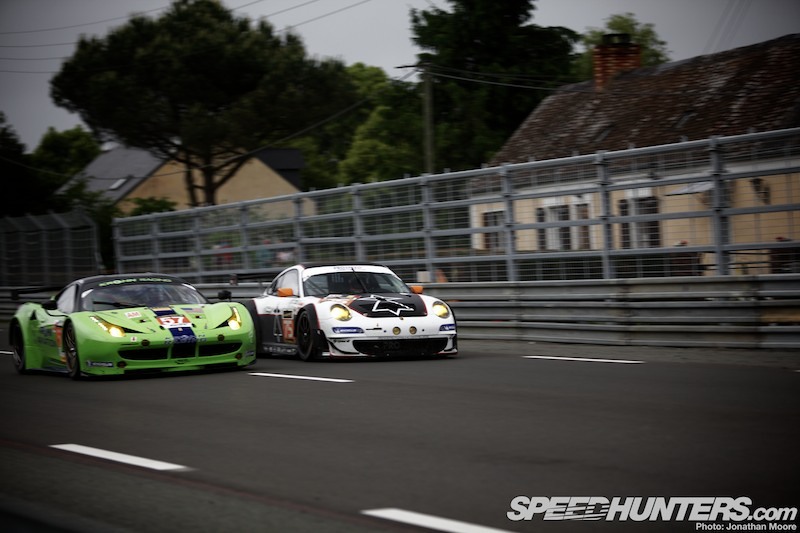 The long run back from Arnage funnels down at the Porsche Curves into a final blast between concrete walls, again with massive entry and exit speeds before braking for the Ford Chicane just before the finish line. Tommy: “The Porsche Curves is probably the most difficult section on the track. At some point the car won’t be that great to drive – when you’re on older tyres or things like that – and that’s when it’s massively difficult to keep the speed up. 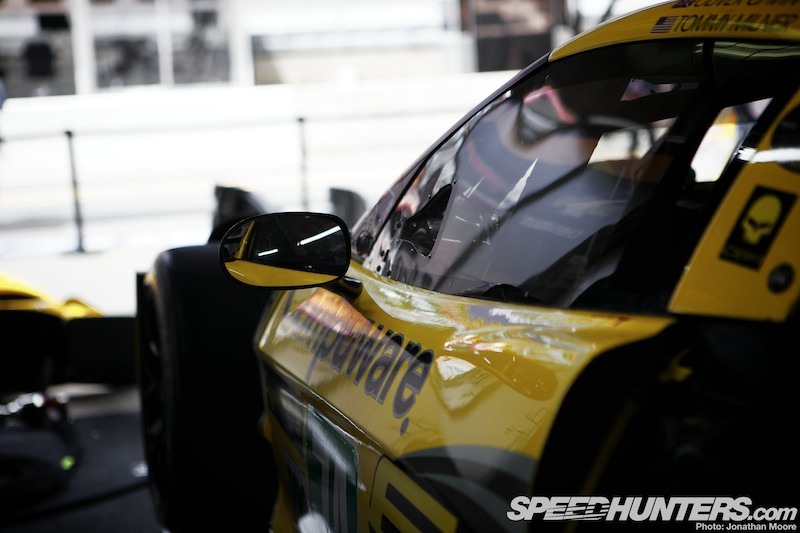 Anyone can drive slower and sort of ignore the problem, but it’s very hard to keep the speed up when the car’s not that good because it’s so quick and we run so little downforce. 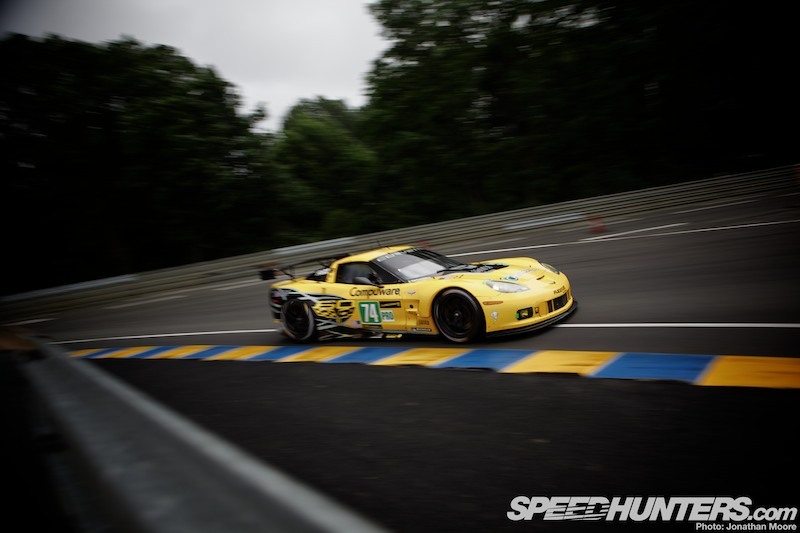 “You do kind of get tunnel vision around the track, particularly driving down the Mulsanne. You’re peering as far down the road as you possibly can look, just trying to pick out the braking point. Once you think you’ve got it, you follow it in, double check that it is actually the right point and then just go for it. 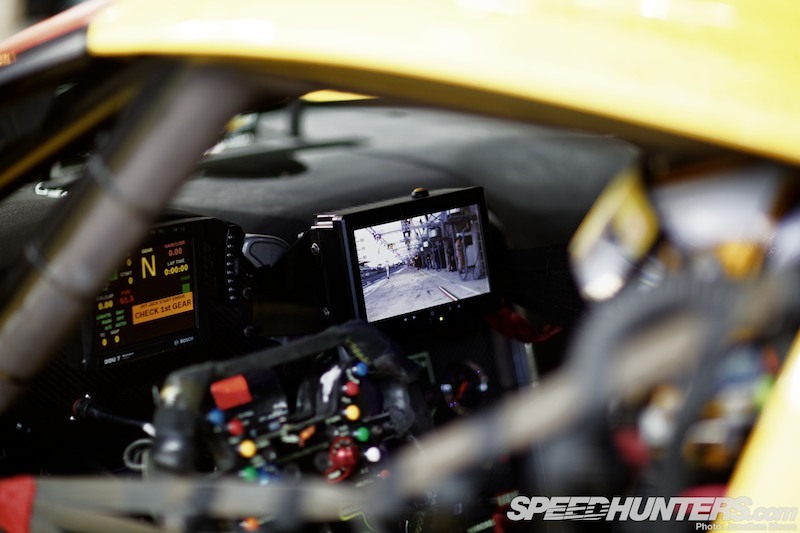 There’s a lot of the lap where you’re not even looking forward: you’re looking at your rear-view camera, the dash read-outs, the mirrors or checking for reference points by the side of the road – other things besides the road. There’s really not much to see out there! We’ve all driven on the road at night, and even on a public road you tend to have heightened senses and need to have a bit of blind trust in the road ahead. Tommy: “At night you go a lot off your muscle memory, of what you learned from driving during the day when you have every reference point. You get a rhythm in the daytime, and for night driving you try to find that rhythm again. When you can get back in that groove, even without really being able to see what’s going on, that’s when you go quickly. You have to know you can turn in. 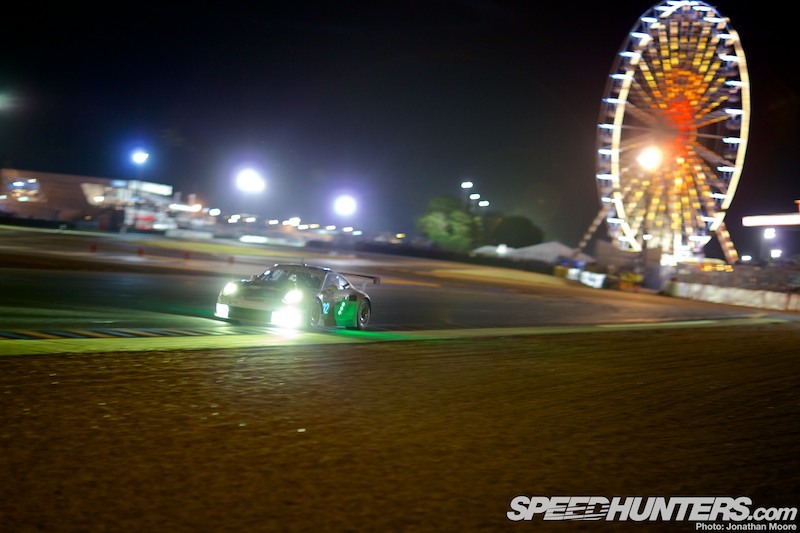 For instance, at the Porsche Curves, it’s fairly well lit on entry but it gets dark as you go around it. 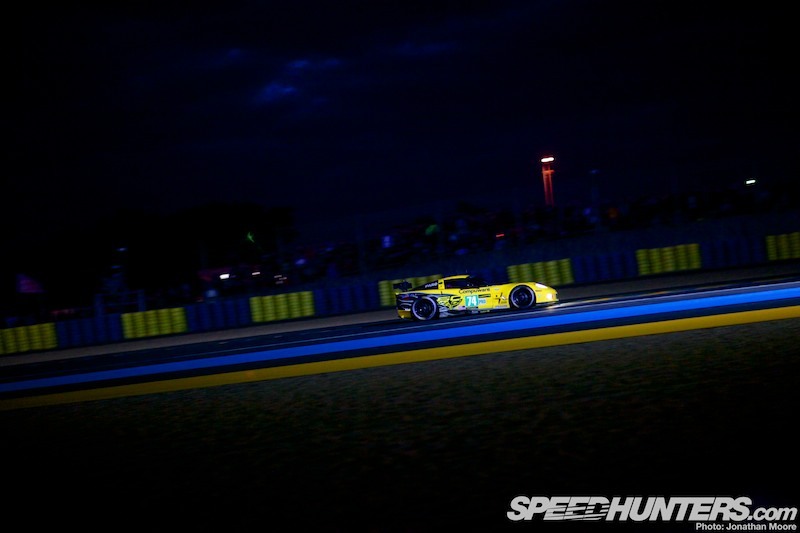 But there’s a rhythm and flow that gets ingrained from driving so many laps, that you can then reflect on at night to get back on the level. 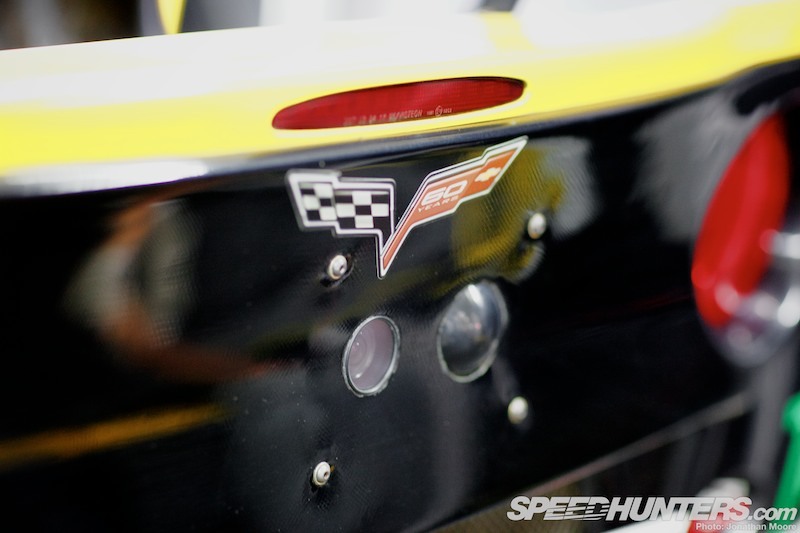 There are side mirrors, but typically for a race car they’re pretty flimsy and look like they’ll bounce around at speed. With a closed-off rear there’s no rear-view mirror, so the Corvettes have long carried a camera system to give better views out back. The biggest improvement to the camera and cockpit screen was the addition last year of a radar system to supplement the picture and provide invaluable overlays about traffic. 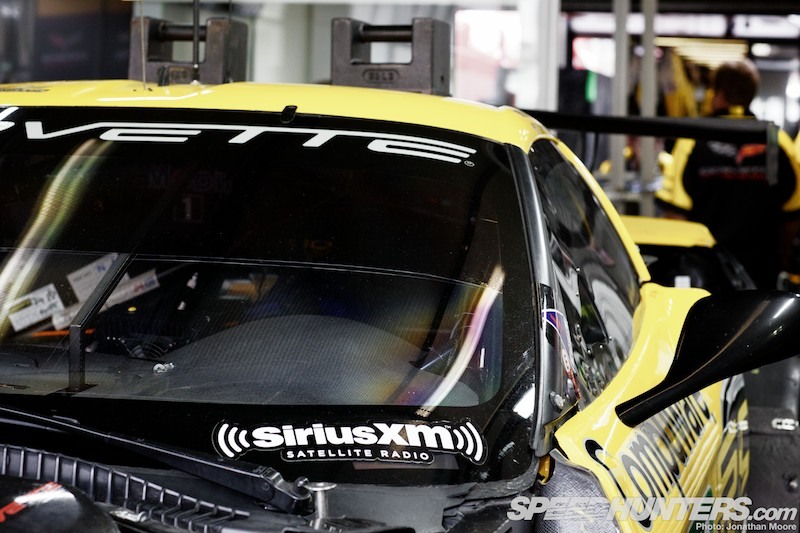 It’s an insanely cool system: the radar picks up moving objects (even stationary in the pits, it would pick up team members walking around the garage) and mark them: red for moving in, yellow for staying the same and green for moving away. The chevrons change shape and size depending on distance, and combine with scales on either side of the screen to show distance and closing speed. Finally, the biggest help is a big red arrow that points to the side of the car that the overtaking car is coming from. Here’s a video clip from the development system – it’s now even more sophisticated. Electronic gizmos may help with what’s behind, but the most basic and obvious aid sits out front: headlights. Tommy: “In the dark you’re hoping your lights are aimed perfectly so you can see the reference points. That’s the hardest thing at night. All the braking markers are reflective, but your apexes and track out points are not. They’re in the darkness until they’re lit up by your lights, only then you can see them. “We try and set up our lights to get as wide an arc as possible. We have two that aim sideways like corner lights, and two that shoot forward so they light up all the reflective bits and pieces that are out there. The team has a system at the shop where they aim and align all the lights, so all of our spares have been set up in case we need to swap them. 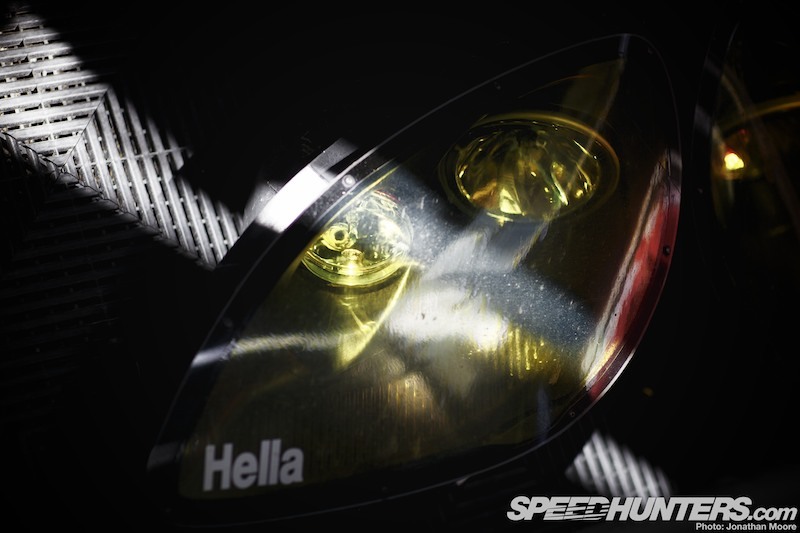 Of course, whilst it’s great if your own headlights are bright, there are 50-plus cars around you also packing blinding beams. 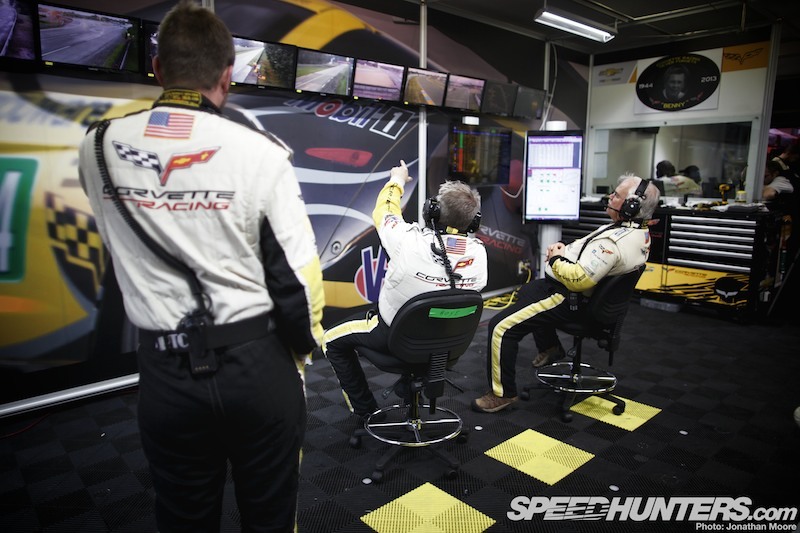 Backing up the data is a vital human element back in the pits: namely Tommy’s crew chief Brian Hoye and his team, who sat in the garage in front of a long line of screens linked to CCTV and TV camera coverage around the track. 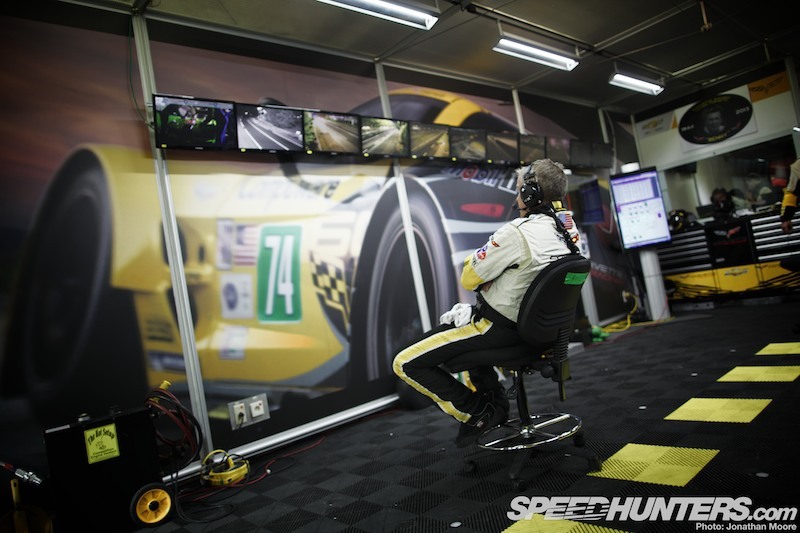 It was an impressive sight: Brian had picked out cameras spaced around the lap, and each screen was marked with an approximate time stamp so if they lost sight of their driver they could use the lap-time to pick the car up on the next appropriate screen. They also had access to the ACO’s GPS-linked car tracker and a big telemetry screen for each car. Tommy: “Brian spotted for me almost all through a race; there’s always someone on the radio. He’ll tell me what cars are coming and give me a heads-up, such as that an LMP2 car is six seconds back and closing. 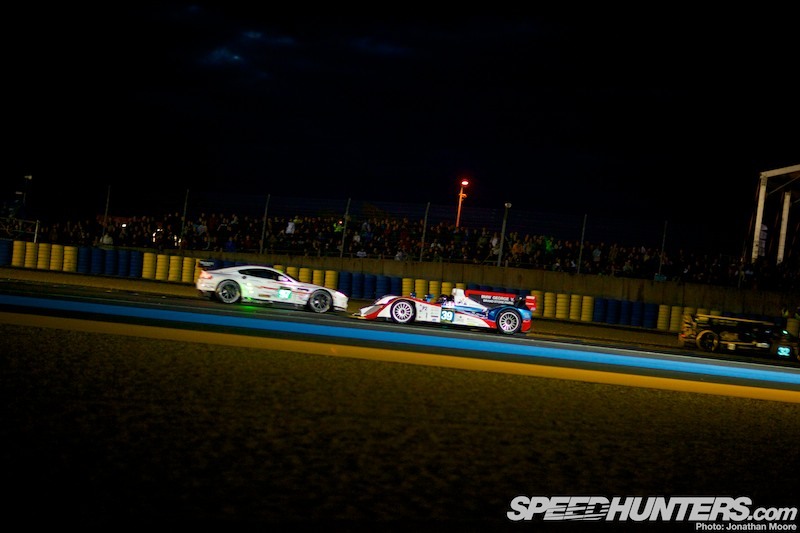 For an LMP1 he’ll tell me way in advance, like maybe when it’s 10 or 15 seconds away. It just clues me in and allows me to drive out of the windshield. 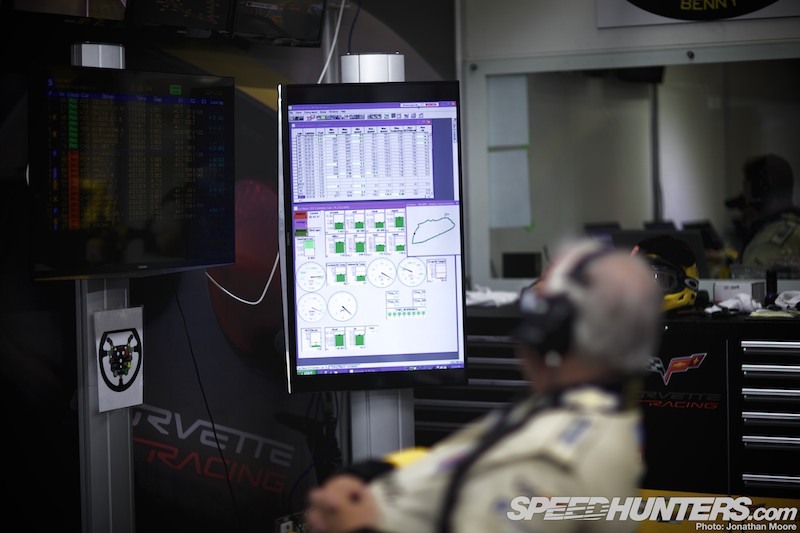 The Corvette team have made sure that all this information doesn’t overload the driver: my thought was that all the technology might actually detract from the driver’s ability to concentrate on hands and feet, but the team have evolved their combination of spotter and on-board tech. Looking inside the cockpit, all the screens are specifically positioned to be in the near eyeline without being overwhelming. Inside the exceedingly tight cockpit, the main dash readout is just below the windscreen, with the TV screen to the right. Tommy: “I’m now really only studying the screens when Brian gives me specific warnings, then I make a concerted effort to look. It’s changed how I use that camera: in the past I would always take periodic looks, just check, check, check. But now anything that comes up behind me will show up on the radar, and it’s a very obvious thing. And then what about the driver himself? 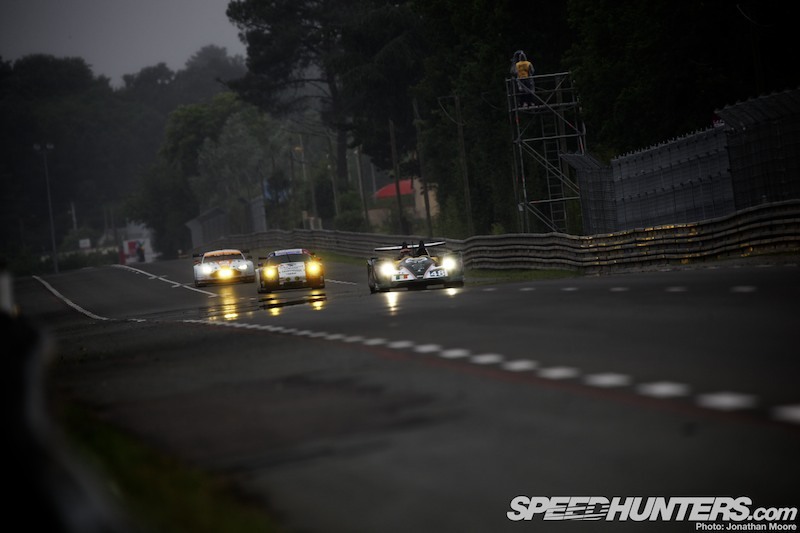 Fitness and skill is one thing, but even I know from driving for five hours in the pouring rain to get to Le Mans how tiring driving can be on the eyes. 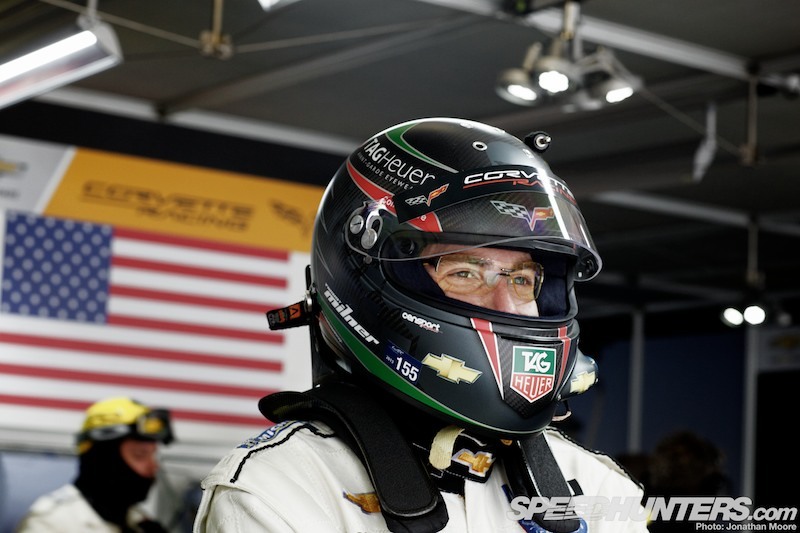 That’s where a new take on an old idea comes in: yellow tinted driving glasses But the Squadras that Tommy and a number of other drivers now use come with a high-tech twist from TAG Heuer, which correct night-time myopia and have an anti-glare coating. 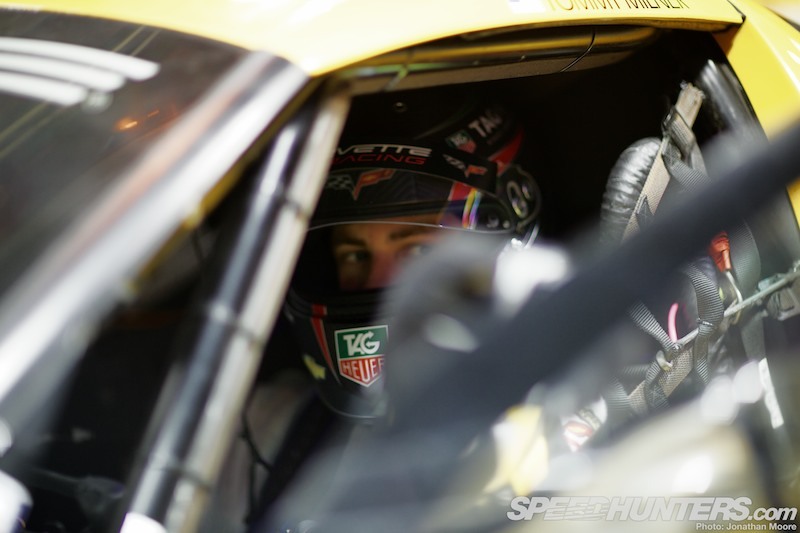 Tommy: “It’s easy to get a bit lost as to where you are on the racetrack, like on the Mulsanne, there are times that if you look at your dash and you’re reading off a lap time or something like that or a pressure for one of the engineers, you can glance back up and have that split second of going, like, ‘Where am I?! How far down the road am I from where I last was?!’. Little things like that, when you lose focus or concentration, it’s a big deal. In the daytime you can relax a bit and let your body take over, but at night you spend a lot of time studying and thinking about what’s coming up, what’s ahead, where’s my braking point and so on. It’s mentally draining. 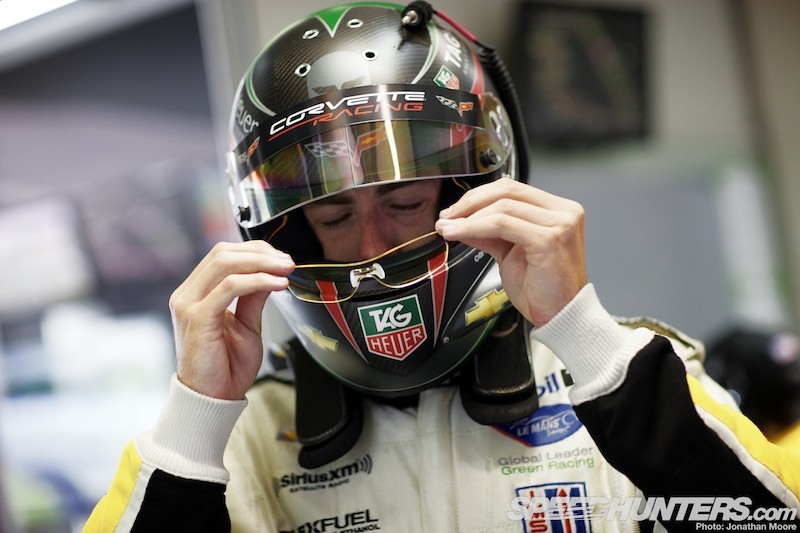 Focus is the key for driving at Le Mans. Over the last week the teams drove in the most challenging conditions for years, and under the worst possible emotional cloud following the accident. My admiration for top-line drivers has gone up another notch.